Last Sunday morning, Anna, Amy, Wendy and I headed to Chicago's Chinatown for dim sum. Amy suggested Phoenix, and the line outside let us know that this was a popular choice for quite a few people. We waited about 30 minutes before being seated. While waiting, Anna and Wendy walked around Chinatown and I just chatted with Amy and bought an iced tea from a nearby tea store. It was kumquat flavored: DELICIOUS. Once inside, we impatiently waited for the carts with food. Unfortunately, the variety of choices wasn't great, but the ones we did sample were quite good. We ordered ribs (sweet, tender, finger-licking!) and taro cakes. I first tried taro cakes in Vegas after Lera recommended them. These had something inside them, which we could not quite put a finger on...mushrooms maybe? I loved the mashed inside and the crispy outside of these balls. We then had these really cute wraps: they were stuffed with a variety of vegetables, and the wrap itself was a super thin omelet! Wish I could replicate this at home, but I don't think I'm that skilled. Unfortunately, none of the carts had greens. I was so looking forward to asparagus, green beans or broccoli, but no such luck. Instead, we ordered Chinese broccoli off of the menu: it was tender and had a slightly garlicky sauce. And of course we had to order dumplings! I honestly can't even remember which ones these were...pork? Chicken? Shrimp? I just remember they were really good. We made quite a mess! The food was decent, but I would not necessarily recommend this place too highly. Next time I'll check out some of the other zillion places for dim sum in Chicago's Chinatown. While I'm getting my pictures ready to post, here are a few pictures of new dishes I bought in Chicago. Anna told me about a sister store to Crate & Barrel (CB2), and that's where I bought 3 new dishes: a black plate and two little white and green plates. How cute are they? Cannot wait to start cooking and using these plates to serve the food. When I saw the challenge, I was excited! 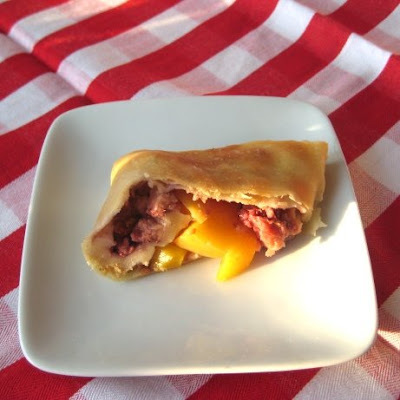 I've never made strudel, and the task did not seem daunting. 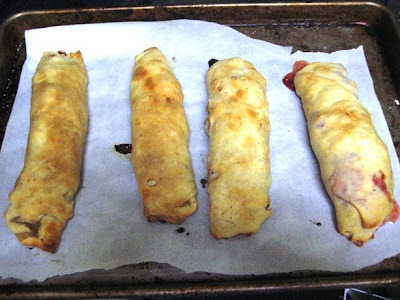 I made a few changes to the recipe and decided to make 4 mini strudels: 3 with apple/raisin/walnut/rum filling and one with mango/strawberry/rum filling. 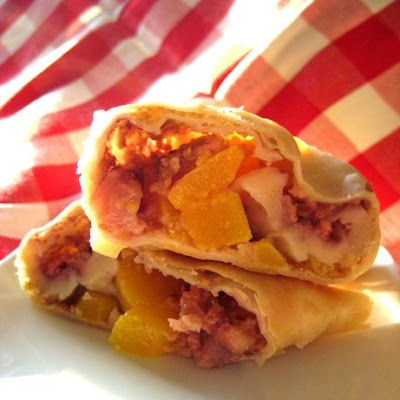 (Take a look at what I did with leftover mango/strawberry filling!). For the dough, I used bread flour instead of regular, and sherry vinegar instead of cider vinegar. The dough was relatively easy to work with. I had a few holes while trying to stretch the dough out, but did not worry about those. Unfortunately I had to wait till the morning after baking the strudel to take pictures and it was REALLY, REALLY sunny, thus the super bright photographs. 5. I first spread the dough with melted butter, then a combination of fresh bread crumbs and butter and then added the filling before rolling it and tucking in the edges a bit. The whole thing baked at 400 for about 30 minutes. My thoughts: I wish I would have more time to make this challenge (I felt rushed because was planning on going dancing, but then it rained and I ended up staying home). I also think I should have cut the fruit into smaller sizes. And like I mentioned earlier, the dough might be more tender with all-purpose flour instead of bread flour. I'm going to be MIA for about 4-5 days because I will be traveling to Chicago with Anna, my friend Wendy and Anna's friend Amy. Looking forward to amazing food, salsa dancing, Second City, a few museums, shopping and just hanging out. Hoping to take some great food photos! 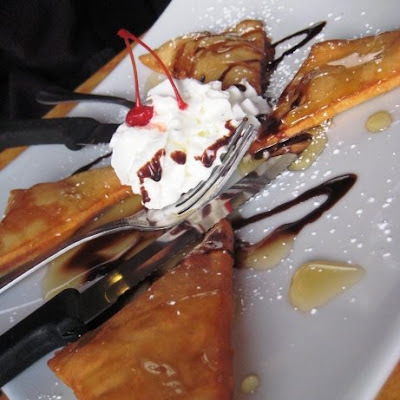 Sometimes you just have to eat dessert first. Or that's how I feel from time to time. 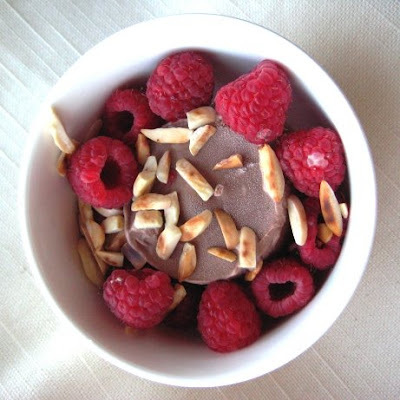 And so I made the following almost-no-cooking-required dessert: Chocolate Ice Cream with Raspberries and Almonds. 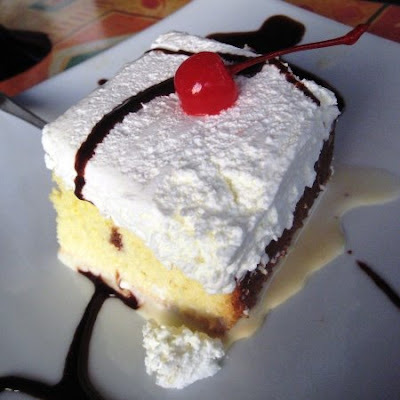 Do you ever eat dessert first? 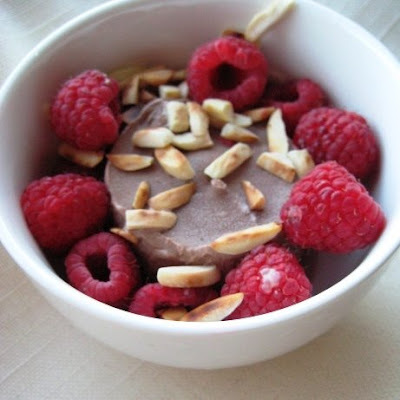 What do you like to put on your ice cream? Over the weekend I did not feel like going grocery shopping and decided to use the ingredients I had in my refrigerator to make a Quick Asian Tofu & Vegetable Soup. It's yet another one of my inventions along the lines of "if you don't use it, it'll end up in the garbage." 1) While preparing all of your vegetables, simmer chicken broth & water with ginger, garlic and jalapeno. 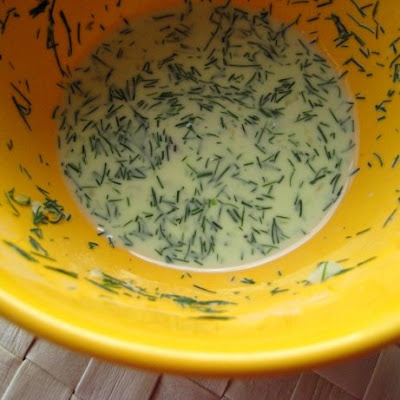 This will infuse the liquid with the flavors of ginger, garlic and jalapeno. After the soup is done, you can "fish out" these 3 ingredients. To make your job easier, you can put them in a tea ball (if you have a large one) or into a cheesecloth before adding them to the liquid. 2) After about 20 minutes of simmering, add carrots. Cook for 5 minutes. 3) Add the rest of the ingredients and cook for 5 more minutes. The peppers should still be slightly crunchy. This is a very versatile recipe as you can add other vegetables to it: broccoli, zucchini, bok choy, or even Brussels sprouts. 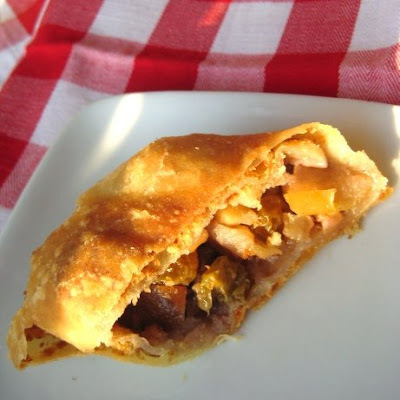 You can also add chicken or leftover pork instead of or in addition to tofu. Why not add shrimp? You can serve the soup over rice or noodles. The possibilities are endless! Instead I made Salmon, Cream Cheese & Vegetable Omelet. 1. Heat the olive oil in a non-stick pan. Saute onions and peppers till they soften and slightly brown. 2. Whisk together eggs and milk. Season with salt and pepper. Pour the egg/milk mixture over the eggs and let it set. 3. When the eggs are almost set, top them them smoked salmon, spinach, capers and dollops of cream cheese. Cover and cook for 2 minutes. 4. Serve with toasted English muffins. Delicious! You can make the same omelet with added tomatoes, olives, zucchini or any other vegetables. This will be good served at room temperature for brunch. On Wednesday Jenn and I decided to get together and catch up. Of course food had to be involved. 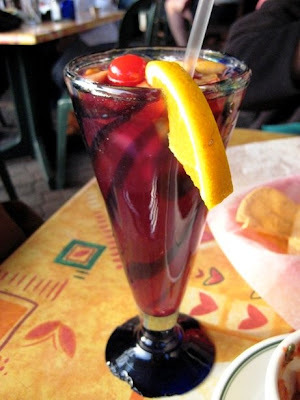 Since it was a gorgeous day, Jenn suggested Los Tios in Del Ray area of Alexandria. They have a patio with tables, and we liked the food there last time. Our friend Cat joined us too. We started with white sangria for Jenn and me and red sangria for Cat. DELICIOUS! And such pretty presentation. 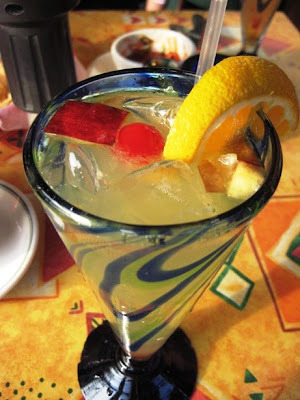 The sangria must have been on a weaker side, because it did not go to my head at all. While we sipped our drinks and ate chips and salsa (the salsa was awesome: you could see chunks of fresh tomatoes and onions, and it was just medium hot) we caught up on all the latest and greatest news in our lives. And then it was time to order! 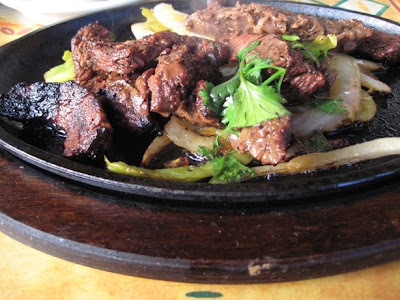 I chose beef fajitas. That was a great choice. The beef came out steaming hot and smelling of fire (in a good way). It was cooked with onions and peppers, as you would expect, but also had a surprising ingredient: celery! The steak was juicy, tender and well seasoned. 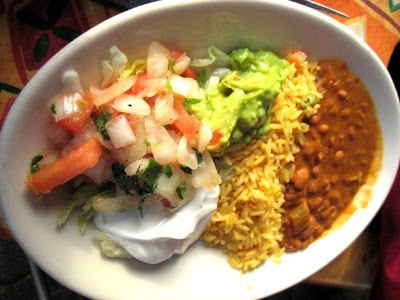 The rice, beans, salsa and guacamole were a perfect accompaniment. And then there was dessert! Yes, after that big meal, we still ordered dessert. Why? Because I'm not the only one who wants a bit of sweetness after a meal, and I also thought it'd be a good chance for me to get something to write about for SugarBomber. 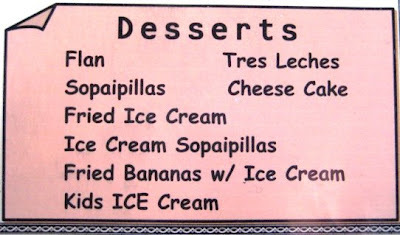 We decided to share an order of sopaipillas (fried dough with honey, whipped cream and chocolate sauce) and tres leches (cake cooked and soaked in 3 different kinds of milk). Let me just say, there were no leftovers! This was a perfect way to spend a Wednesday night with some friends. Good company, good food, fun atmosphere. And then it was time for Jenn to give me a ride home (I assure you all the effects of sangria were well gone by then), after which I went salsa dancing...and hopefully burned at least 1/100th of the dessert! A few nights ago I wanted to make something fabulous for dinner. I already had asparagus at home, and sashimi style tuna was on sale. I decided to buy it along with fingerling potatoes and make a simple, but flavorful meal. There are no exact measurements for this "recipe." 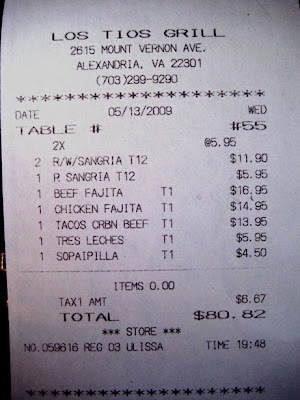 Instead, this is just a blue-print for a meal. 2. Microwave potatoes for 4 minutes. This step allows you to shorten the amount of time you'll have to roast potatoes: they'll be already tender inside and will only have to get crispy in the oven. 3. Drizzle potatoes, asparagus and garlic cloves with olive oil, lemon juice, salt and pepper. Roast for 10 minutes at 400, increase the heat to 450 and roast additional 10 minutes. 5. Serve sliced tuna steak with potatoes and garlic. On the side, serve asparagus sprinkled with Parmesan. If you don't like fish, you can make the same meal with steak or chicken (obviously you'll cook the chicken all the way through). If you don't like asparagus, roast some green beans or zucchini. This is a quick and delicious meal to serve on any weeknight. As if being part of Daring Bakers wasn't enough, I decided to also join Daring Cooks. 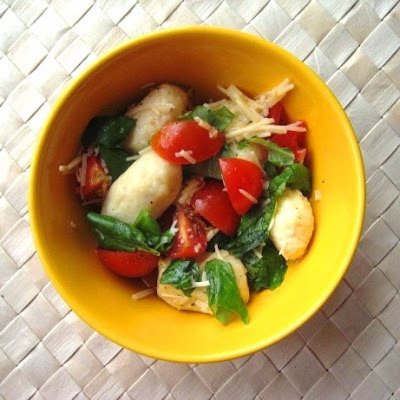 The first challenge was to make Ricotta Gnocchi. Once I found out what the challenge was, I felt pretty confident I'll be able to make it. Why? Because I've made regular gnocchi in the past and liked how they turned out. Source: From The Zuni Café Cookbook. I halved the recipe and added zest of one lemon, black pepper and sea salt to my gnocchi. I also used bread flour instead of all-purpose flour because that's what I had on hand. 1. 24 hours before making gnocchi, line a sieve with paper towels, add your ricotta, and let the extra liquid drain over a bowl for 24 hours in the refrigerator. 2. In a bowl combine ricotta, slightly beaten egg(s), salt, Parmesan, black pepper and lemon zest. 3. 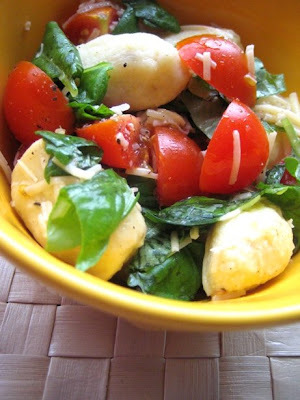 Add enough flour so that you'll be able to form gnocchi (similar to forming meatballs). 4. Bring a large pot of salted water to a boil, lower the heat to a simmer. 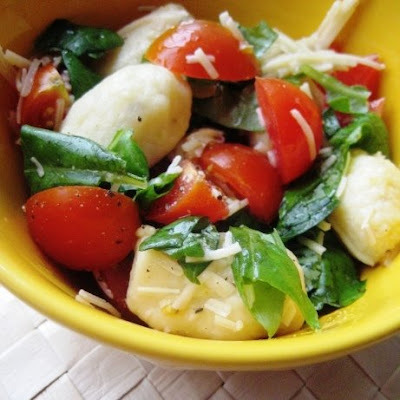 Drop 5-10 gnocchi at a time (depending on the width of your pot) and let them cook for about 3-5 minutes. Once the gnocchi are done, they will rise to the top. As far as the sauce goes, I decided to do something very simple. I added quartered cherry tomatoes, torn basil leaves, a bit of olive oil, Parmesan cheese and freshly ground black pepper. I did not want to make a heavy tomato sauce because I wanted the lemony taste of gnocchi to shine. Thoughts: I was very pleased with how this recipe came out. It was so much easier to make than the potato ones because you did not need to "rice" anything. Next time I think I'll try to make this recipe with all-purpose flour for a more tender texture. 1. In a bowl mix mango, strawberries and rum. 2. 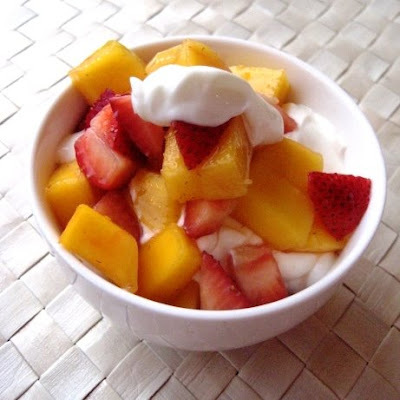 In a serving bowl layer the fruit mixture with the yogurt. Variations: You can make similar dessert with any other fruit/berries and also incorporate fresh mint. 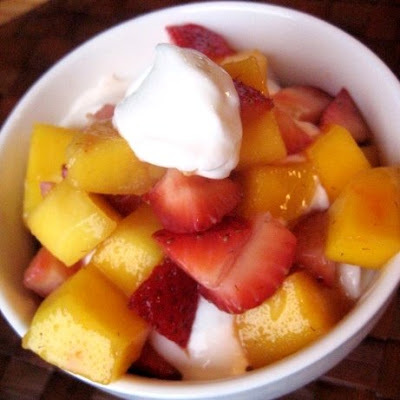 Try using vanilla yogurt or add a bit of brown sugar if your fruit is not perfectly ripe and sweet on its own. Sometimes (not often) I want something light and relatively healthy for dinner. I also feel aggravated that the prices of food have been increasing: so I try to come up with some inexpensive meal ideas. That's how this Nappa Cabbage and Black Bean Salad recipe came about. 2. Let the salad sit in the refrigerator for at least 30 minutes. 3. 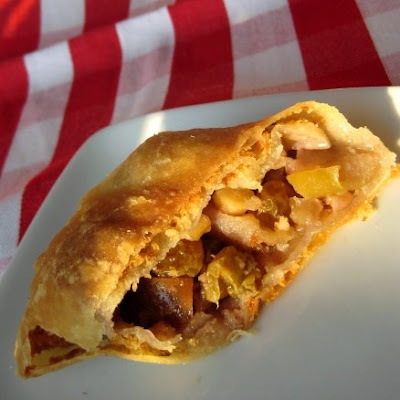 Serve with grilled chicken or fish or beef! This is my last post for this week, but please check out My Mom's Apple Cake recipe I posted on DC Examiner as well as Mother's Day Brunch Ideas. You know how the name of my blog is Mango & Tomato? 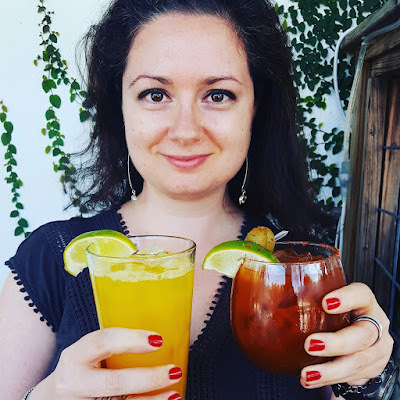 Well, a few nights ago I decided to come up with a recipe that actually involves both a mango and a tomato! And I did. And I really liked it! So here it is: Mango & Tomato & Avocado Salsa. Optional: you can also add jalapenos to your salsa. And if your mango wasn't perfectly ripe (as was the case for me), you can even add a bit of sugar! Please share your ideas of combining mangoes and tomatoes...maybe I'll try them out and post about it! Growing up, my parents would make an Omelet Surprise for breakfast on a week-end. It was basically a combination of eggs and whatever we had leftover from lunch or dinner the night before. That meant potatoes, vegetables, hot dogs, etc. This is exactly what I made last Saturday: all I had in my fridge was a carton of eggs and random ingredients leftover from the previous week. 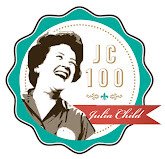 This is a great "recipe" to test your creativity skills! 1. Heat oil in a non-stick pan. Add potatoes and cook for about 5 minutes until they are browned. 2. Add onions, garlic and cayenne powder and cook till potatoes are tender. (If you find that potatoes are beginning to stick, add a bit of water, cover the pan and let potatoes steam for a bit. Then take the lid off and let the browning process take place). It is very important to make sure your potatoes are cooked through before moving onto the next step. 3. Add tomatoes and cook for a few minutes. 4. Whisk eggs with milk, salt & pepper and pour over the potatoes/onion/garlic/tomatoes mixture. Let the eggs "set." 5. 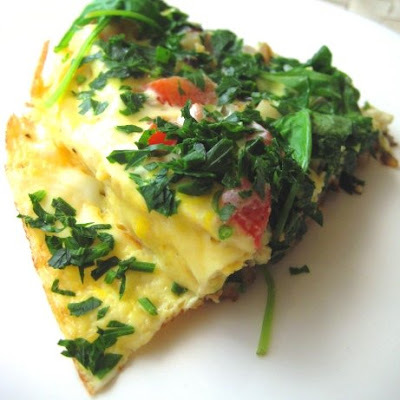 Top the omelet with fresh parsley and arugula, cover the pan for a few minutes and you are ready to eat! Optional: depending on what you have on hand, you can add red peppers, broccoli, green beans, peas, sausage, cheese, mushrooms, etc. The possibilities are endless! This omelet is great served straight from the pan, but can also be served at room temperature or even cold! 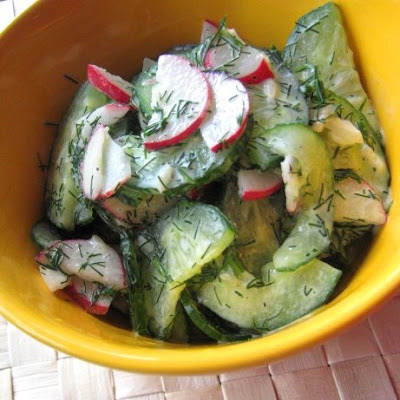 Cucumber & Radish Salad is something I grew up eating in Russia. It's a perfect dish for hot summer days. 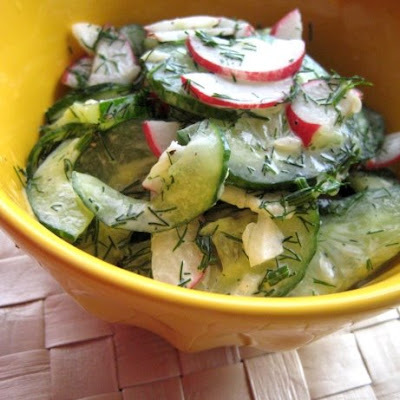 The typical ingredients for this salad are English cucumbers, radishes, dill and sour cream. When I decided to make this salad a few days ago I was out of sour cream, but I did have Oikos Organic Greek Yogurt (the company was nice enough to send me 4 coupons for their product!). I decided to improvise and use the yogurt instead of sour cream. 1. Combine all ingredients in a bowl and either chill for 20 minutes or serve right away. Variations: The salad can be made with added peas, boiled potatoes or boiled eggs. 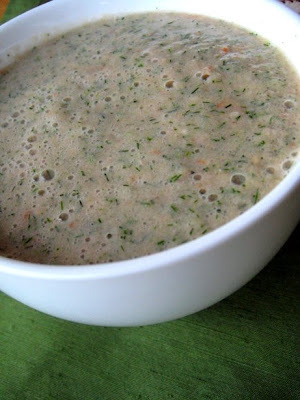 You can also add scallions or red onions, and use either mayonnaise or sunflower oil instead of yogurt or sour cream. How do you use Greek yogurt in your cooking?